I have to show off, but isn't that what the Blog is for??? The precious picture is of my Granddaughter, Nickola, and her quilt that her mommy (Amanda E.) and I made for her Christmas present. 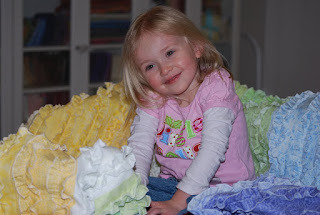 Nickola watched us make her quilt and each day she would walk in and tell us how "Beautiful" it was, and it is! Amanda E. picked out the pattern and the fabric. I'm so proud of her choices and the work she did - it was her first quilt so she learned a lot and had fun too!